I learnt this recipe from some book. Everybody makes fun of me when I say we can make potato dosa. But if you try this once, you will never forget the taste!!!. This dosa is a bit hard to take out from pan. So my initial trials were all big disasters. But this dosa was so tasty that I wanted to master this. So after trying it many times, I could make them perfect. The key is to add as much rice flour as required to make them easy to remove from pan. Grind all the ingredients(except rice flour). Add rice flour. Mix well and make dosas. Some times, the dosas get sticked to tava. Add more rice flour and try again. I usually serve this with honey or mango syrup(ambe paank). Why not put the rice flour also in the blender? Never thought i would end up trying this one…….but tried it and enjoyed it too!! Thanks for a nice quick recipe. I am impressed by your recipe khajaane’ (khazaana). Its so nice to see a rare site of Kannada-Konkani dishes. I am from the old Mysooru region (Mysore for anglophiles). Although, I grew up on staple Mysoor gojjus, huLi-thauvve, saaru, huLI etc. I am always fascinated by the diversity of food (Mysoor, bayalunaadu, malenaadu, kodagu, konkani, dharwad, mangaLooru, karaavaLii etc.) in our Kannada naandu. As is our our music (Karnatak in south, Hindustani in north), languages (various dialects of kannada, konkani, kodava, tulu and other tribal languages) marriage ceremonies, the list goes on…. Cilantro (Corriander) leaves (1/4 cup). This is because I like corriander a lot, one can reduce the quantity. Grate the potato, onion, carrots. Chop the green chillies; grate the ginger. Add the butter milk and mix again. Following this, add water with caution to get the batter to thick dosa consistency. The batter should be thicker than regular idli batter and thinner than the regular dosa batter. Pour the dosa over non-stick pan and fry it with (or without! thanks to nonstick pan!) oil. Serve it with any kind of chutney. i tried this dosa today n it was really very tasty.fast to make n tasty too. how should be the consistency? Mahek, you should make the dosa batter thin. Because the thin dosas taste better than thick. They are little difficult to remove from tava, so add more rice flour if necessary. Yes, the potatoes are ground in mixer along with other things. Let me know if you try this. Thanks tooooooooo much plz tell me goooooood combination plz……. Lathabasappa, I usually serve this with something sweet like honey or pineapple syrup because these dosas taste good when they are made spicy. They can also be served with coconut chutney. Is water to be added too while grinding? I want to try this recipe, but not sure how is it going to get the running consistency to be poured into the pan like a dosa. Smitha, you have to add sufficient water while grinding. Don’t make it too watery since they are bit difficult to remove from tava.You can add more rice flour if you are not able to remove them. alright, will try that, thanks. 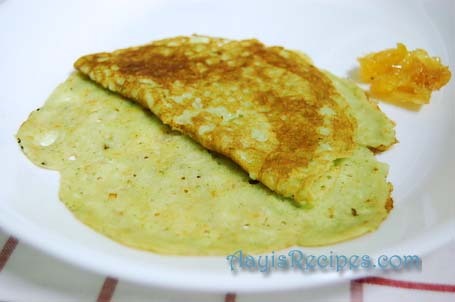 just a quick suggestion..when I searched on potato dosa in your search box, this “Potato Dosa” which is an exact match comes last in the results..hope that is useful..
Did you have any trouble spreading the dosa on the tava?I couldnt spread it well so I made the batter really thin and prepared like we do rava dosas.Was your batter consistency same as regular dosa?I used non stick pan so there was no difficulty removing them,though it took some time to cook well.BUt yes dosa tasted very good.Will definetly try it again. Swarna, As I have mentioned in above post, these dosas are hard to remove from tava. It needs a lot of experiment before you can actually master them. I make them thin if I can take them out from tava easily. But sometimes when I change the tava, I can’t take out thin ones, so I make them thick. You have to spread 2-3 dosas before you could adjust the consistency properly. But its the taste of these dosas that makes me come back to them again and again. I can’t tell you the consistency exactly because these depend on many things, mainly the kind of tava used. I have two non stick tavas which give different results to me. Do we have to keep the batter standing for some time? Varsha, no standing time for these dosas. They are instant dosas, prepared soon after the batter is made. Btw, I am happy to see you back here. Looks like you are busy these days. nanu aasha antha. Bangaloornalli erodu.Nenne inda naanu nimma Aayi special oota,thindi thindu thegidini thanks. Ella thayiarigu ondu tribute thumba chennagide. Nange nimma adageya jothe nimma baravanageya shyli bahala hidisithu aakaranavaagi ee pathra. Keep it up. I have taken many tips from your pages.Keep giving more delicious items.I am enjoying.Hope you can understand kannada part of this letter. This dosa sounds interesting ..n of course a gr8 treat for all potato lovers like me….luks delicious..! Will try this today itself n let u kno..Thnks for d gr8 recipie. N yeah the dosas came out properly,without sticking much….thnks to d exact measurements n procedure details tht u hav provided..! !Coz i just realised….hd i added lil bit of water to d final dosa batter (sinc it looked thick n sticky)….i wud hav hd a tough time removng them frm d pan…! !..good i dint do tht….n sritcly abided by ur instructions.. It was a very filling n deicious meal..! Me n my hubby njoied eating these dosas..Thnks agn.. Thanks for the recipe and useful comment replies too. I had one question does the potato mixture become sticky when it is mashed and grinded in the mixer ?? I was a bit hesitant when I saw the potato mixture to be really sticky , but later on it turned out to be alrite when I mixed it with the rice flour and water .